The rear of the Palace, the Palace Theatre that is. 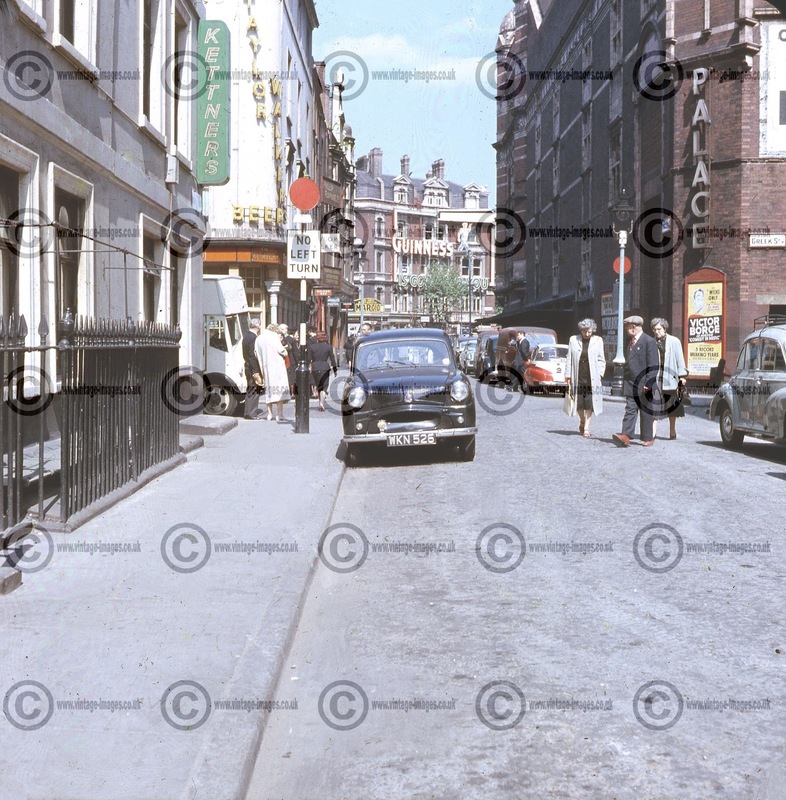 Now, I have NO idea why this particular image was taken, perhaps the three people wandering across Romilly Street are friends of the photographer, but they seem too relaxed to me as normally people posed for the camera. Other than that there is no great focus of interest, just another throwaway shot perhaps at the start or end of a film. Romilly Street had only been named thus since 1937, previously it had been called Church Street, but was renamed due to Sir Samuel Romilly having been born nearby at 18 Frith Street. No, I don't know why they didn't rename Frith Street! The Palace Theatre, from the front, is one of the more spectacular of London's theatres. 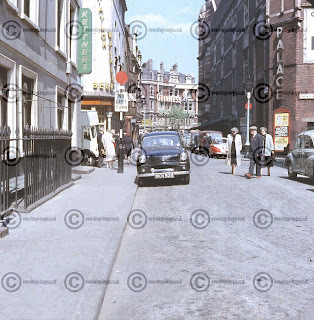 It is situated on what was Cambridge Circus, now just a road junction but back in 1957 a roundabout hence the "Circus" sobriquet - much like the more famous Oxford Circus that most people have heard of. However, from the back, it reveals itself to be just another brick built monolithic edifice of no great arcitectural merit - much like any other theatre. We know it is 1957 as Victor Borge, the comedian and pianist, is appearing in his one man show, fresh from a record breaking run of three years on Broadway. Looking at the cars, the most prominent is a Standard Ten, which wouldn't park there today as the area is infested with double yellow lines! The three wheeler looks to be a Heinkel Kabine, in production from 1956-58 so almost brand new here with possibly a Fordson Van behind the Heinkel. The Coach and Horses pub on the corner is still open for business, although no longer serving Taylor Walker's beer. Taylor Walker, founded in Stepney in 1730 as Salmon and Hare were taken over by Ind Coope in 1959. "Guinness Is Good For You" is probably the most famous of the Guinness slogans of the period and when the hoarding is as large and prominent as the one at the end of the street, overlooking Cambridge Circus you couldn't ignore it! The yellow sign, which is almost unreadable in this image gave me a few problems. Eventually, looking at another shot of Cambridge Circus from 1952 that I have, and even on that slide it is partially obscured, it transpires that it is an advertisement for Dameroids - some type of patent restorative elixir, described on the label as "A Safe and Sure Remedy for General Weakness, Spinal Exhaustion, Neurasthenia, Physical Decay, and Loss of Nerve Power." Obviously so good that it isn't available today!! The snake oil salesmen were alive and well in London half a century ago! !